See the new IIHS Safety Award Winner – 2017 Ford Fusion Near San Francisco, CA. The 2017 Ford Fusion recently earned the prestigious Top Safety Pick+ Award from the Insurance Institute for Highway Safety (IIHS). The Fusion earned a top GOOD rating each of the five IIHS test modes. These included tests for frontal collisions, side impacts and roof crush protection. In 12 mph and 25 mph tests at the IIHS track, when equipped with Active Braking the 2017 Ford Fusion successfully avoided collisions, earning a SUPERIOR rating for front crash protection from the IIHS. A new, modified front-end structure on the Ford Fusion was citied for good performance in small overlap front tests. The addition of Ford’s Active Braking also includes a forward collision warning component that meets National Highway Traffic Safety Administration (NHTSA) criteria. Each year, the IIHS awards Top Safety Pick titles to vehicles that exemplify effective and leading edge safety measures. The Top Safety Pick+ title is reserved only for models that earn good ratings in all five crashworthiness tests and have available front crash prevention systems that earn an advanced or superior rating. 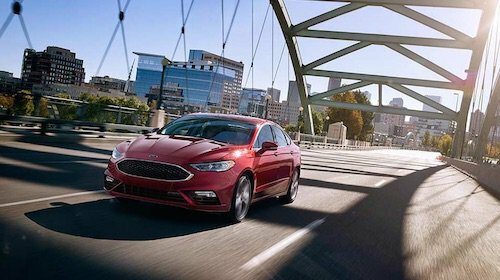 To learn more about the 2017 Ford Fusion and its award winning safety features please contact our Ford Dealership in the San Francisco Bay area.